IBM has revealed a swathe of new cloud technologies and capabilities, Watson enhancements and delved deeper into the opportunities that artificial intelligence (AI) opens up for businesses seeking a competitive advantage in the market. 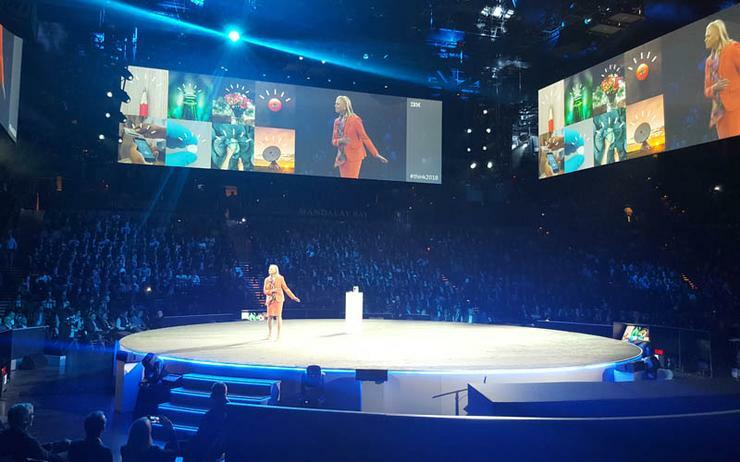 Chairman and CEO, Ginni Rometty, told about 30,000 delegates at its Think conference in Las Vegas that IBM’s reinvention was in line with the era of data, which is about innovative technologies banking on AI and cloud. Among many of the new cloud capabilities that Big Blue has announced, Rometty specifically highlighted IBM cloud for business, which she explained was about providing a consistent approach to cloud -- whether it’s private, public or on-premises. “We’ve reinvented IBM all for the era of data and it’s been about innovative technologies, industry expertise, and then always underpinned by trusted security,” Rometty said. She also touched on how expanding IBM Cloud Private for data, which will enable companies with private clouds to reap all the benefits of a public cloud for data, so they ingest more data than anyone else in the market in their own private cloud. Rometty indicated that only 20 per cent of world’s data was searchable, meaning the remaining 80 per cent belongs to individuals, making them disruptors. She also advised companies to leverage digital platforms, embed learning in every process and empower people with digital intelligence. This then paves the way for AI. At the same time, IBM released its new Power9 processor on the IBM Cloud, which Rometty claimed trains AI faster than anything currently available in the market. Specifically the Power9 processor is built for compute-intensive AI workloads and uses Nvidia Tesla V100 GPUs, which are connected via a high-speed NVLink interface, which improves deep learning frameworks, helping data scientists to train more accurate AI models faster. The company also unveiled PowerAI on the IBM Cloud. PowerAI is a enterprise software distribution of open source learning frameworks such as Tensorflow, Torch and Caffe, making installation and configuration happen within minutes, rather than days. Meanwhile, Big Blue introduced a new SAP-certified IBM cloud application management service for SAP Hana workloads, making the company one of the first to offer cloud support for massive workloads of up to 24TB. On the back of its partnership with Apple in 2014, IBM revealed two new offerings involving IBM Watson Services for Core ML (Apple’s AI) and IBM Cloud Developer Console for Apple. Specifically, IBM Watson Services for Core ML will allow businesses to build AI-powered apps that securely connect to their enterprise data, can run offline and on cloud, and that continuously learn, adapt and improve through each user interaction. One company that spotted the opportunity within this is Coca-Cola, which is currently partnering with IBM, working on prototypes for how IBM Watson services may transform in-field capabilities. Initial functionalities being analysed are custom visual recognition problem identification, cognitive diagnosis and augmented reality repair. The new IBM Cloud Developer Console for Apple will provide tools such as pre-configured starter kits, along with AI, data and mobile services for Swift, enabling developers to link to IBM Cloud to build apps that are easy to code, fast to deploy and can be integrated with enterprise data. On the back of this, IBM is also launching its Cloud Hyper Protect Starter Kit to enable iOS developers to safeguard credentials, services and data using the IBM Cloud Hyper Protect services. This facilitates building enterprise apps on the IBM Cloud, and further complements the high level of security of Apple devices. IBM has also joined the chorus in voice assistants, through its launch of its smart enterprise Watson Assistant, which aims to combine AI, cloud and the internet of things to help businesses enhance their brand and customer experiences. According to IBM, Watson Assistant can be embedded into anything and be used in industry-specific applications where businesses can also 'white-label' the service. The offering can span many industry sectors such as hospitality, automotive, retail and banking. As it develops a deep understanding of the user, providing additional factors such as their location and time of day. The difference between Watson Assistant and others is that learns through each interaction. Julia Talevski travelled to IBM Think in Las Vegas as a guest of IBM.